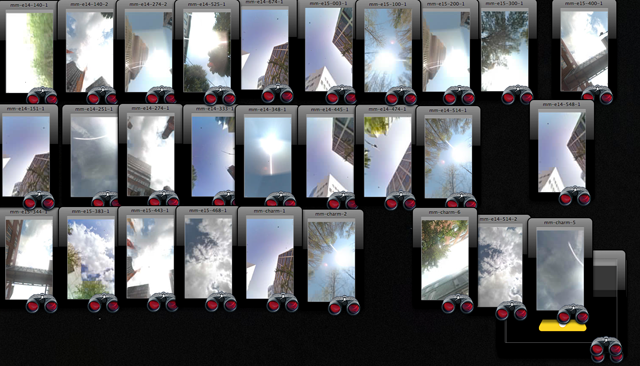 A networked art project that detects the user's location and animates the Google Street View sky above their heads. 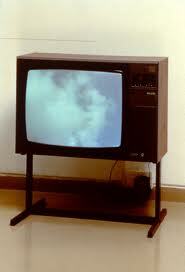 The project is a reimagining of SkyTV, Yoko Ono's famed video work from 1966. SkyTV by Yoko Ono, 1966. In SkyTV, Ono brought the outside space inside the gallery. In contrast, iSkyTV brings the interior space of the database outside and invites viewers to reflect on a world in which our natural resources and landscapes have been digitized, databased, copyrighted and archived. iSkyTV is designed for use in many contexts including web & mobile devices, desktop screensavers, and gallery installations. It premiered at SXSW 2013 and is currently installed at the MIT Media Lab where it debuted as part of the Other Festival. In this installation, iSkyTV serves a timekeeping function and appears every hour on the hour on screens throughout the lab. iSkyTV is a project by the Institute for Infinitely Small Things with Sophia Brueckner. Contact us with questions. The Institute for Infinitely Small Things conducts creative, participatory research that aims to temporarily transform public spaces and instigate dialogue about democracy, spatial justice and everyday life. The Institute’s projects use performance, conversation and unexpected interventions to investigate social and political “tiny things”. Our membership is varied and interdisciplinary. For this project, the Institute for Infinitely Small Things was led by Catherine D'Ignazio, a.k.a. kanarinka, who is an artist, educator and software developer. She is the former Director of the Experimental Geography Research Cluster at RISD’s Digital+Media MFA program and currently a graduate student at MIT's Center for Civic Media. Her artwork has been exhibited at the ICA Boston, Eyebeam, MASSMoCA and numerous public street corners around the world. Sophia Brueckner, born in Detroit, MI, is an artist and engineer. Inseparable from computers since the age of two, she believes she is a cyborg. She received her Sc.B. in Computer Science and Applied Mathematics from Brown University, worked as a software engineer at Google, and earned her MFA in Digital + Media at the Rhode Island School of Design. She feels an urgency to understand and bring awareness to technology's controlling effects, and to encourage the ethical and thoughtful design of new technologies. She recently joined the MIT Media Lab as a graduate student in the Fluid Interfaces research group. iSkyTV is a 2012 commission of New Radio and Performing Arts, Inc., for presentation on its Turbulence web site. It was made possible with funding from the National Endowment for the Arts.